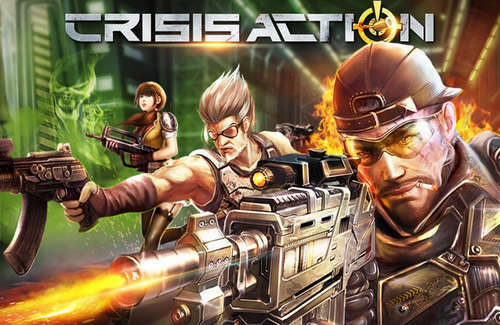 Crisis Action by Hero Games is an online/offline action-packed shooter perfect for Counter Strike fans. The game is all about dangerous missions, shooting various weapons, and dominating the battlefield. The gameplay is pretty straightforward. You are handed a gun and try to work with your team to shoot down your opponents. You have the option to customise your gun and armor using parts you unlock. Plus you can play offline in solo vs bots missions which is a plus for those without an internet connection, or to train before joining the battle online. By using the Crisis Action unlimited money mod apk you can play with maximum abilities and tools to have the upper hand in the battlefield. You can not revive yourself as this does not have unlimited diamonds hack, but you probably won't need diamonds because our version has the best tricks to avoid getting killed by enemies! no XP or Gold mod also which is not needed anyways! With over 40 upgradeable weapons and kits including but not limited to pistols, assault rifles, sub-machine guns, sniper rifles, grenades, Gatling Gun, body armor, ‘Jack O’ Lantern’ disguise, and different skills, you'll definitely crush your enemies in online FPS combat! Install the apk file, Place data folder "com.herogames.gplay.crisisactionsa" into SDCard/Android/Obb/ and play.